ATF-2 beamline – view looking downstream. A key feature of the ILC is that it is a single-pass machine. In contrast to a circular accelerator, where the beam goes around many times, the ILC beams pass through each accelerator element only once, including the interaction point. For the accelerator, this means that for each accelerating module, the machine must be very efficient at transferring wall power into the machine beam, with the added requirement that the final beam must emerge with very low emittance so that it can be focused to the very tiny beam spot required to achieve high luminosity. The ATF-2 at KEK is a special test beam line that has been built to demonstrate the ability to achieve ILC-like namometre beam spots and stabilise them. Recent tests have demonstrated beam spots that are within a factor of two of the ILC design and promise to improve in the future. The Accelerator Test Facility (ATF) at KEK is a prototype storage ring that is being used for ILC R&D aimed at creating and demonstrating that a low emittance beam can be focused to namometre sizes, which is required to obtain ILC luminosities. 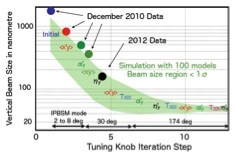 Earlier final focus studies were carried out at SLAC using different beam optics. The compact ATF-2 optics represent an improved scheme based on local chromaticity corrections that should be capable of achieving a vertical beam size of about 37 nanometres at the interaction point (IP). Once achieved, the R&D programme will shift the focus to maintaining the small spot size, controlling beam jitter and stabilising the beam at the IP at the nanometer level. It should be emphasised that ATF-2 is an international R&D effort, being carried out with equipment contributions from all around the world. It has an international governance and a strong international presence in carrying out the R&D programme. In some ways, this collaborative programme is a successful mini-version of the type of collaboration we formed to carry out the global ILC R&D and accelerator design programmes and that will continue to implement the project. 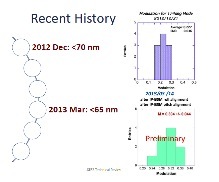 ATF-2 achieved a 72.8-nanometre vertical beam spot soon after the PAC review and improved further to 65 nanometres by March 2013. As I indicated above, our progress had been slowed by the earthquake in Japan, however there was significant progress almost immediately following the technical review (see figure). Nevertheless, because of the importance of demonstrating the final focus of the ILC, we decided to follow up by initiating a technical review of the ATF-2 goals, progress and plans. We held the review on 3 and 4 April 2013 with the goal of assessing the present technical status and plans, as well as give guidance regarding future programme needs for the ILC. The GDE ATF-2 review report will be available soon. I summarise some key findings below. understanding emittance preservation at higher bunch charge is a new goal that has emerged from the studies to date. The ATF/ATF-2 R&D programme is one of the central ILC R&D tasks needed to establish feasibility and to develop technologies for a linear collider (ILC and CLIC). The tests have been very successful, despite the earthquake setbacks, however not all of its ILC goals have been achieved yet. The next stages of the programme are crucial for the ILC and for establishing the even more ambitious goals for CLIC. The demanding final focus optics can only be studied at this unique facility. 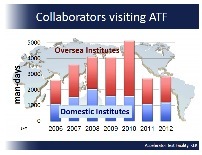 It was pointed out to us that the ATF programme at KEK is under severe financial stress. We hope the resources will be found to successfully continue the programme and carry out the next stages of this important and successful R&D.